Does Witchcraft/Wicca actually have power? If so, what is its source? Does the Harry Potter series’ presentation of child-friendly Witchcraft make its philosophy any more acceptable just because it is packaged as "children’s fantasy literature"? Best selling author Caryl Matrisciana, one of today’s leading experts on world religions, sects, and cults, along with author Robert McGee answer these questions and draw parallels between Potter’s so-called "fantasy" worldview and Witchcraft as it is practiced by many today. Viewers will hear witches being interviewed about their beliefs and see footage of their actual rituals, spells and ceremonies. "In addition, Caryl Matrisciana explains Potter’s Wiccan symbology and its similarities to today’s neo-pagan beliefs and practices: Deification of Mother Goddess, Meditation, Black Magic, Curses and Spells, Divination and Sorcery, Occult Symbology, Evolution and Reincarnation, Demon Possession, Seasonal/Nature Celebrations, Communing with the Dead and Spirit World, "Dark" aspects of Wicca, and more. Young readers today, more than any other time in history, have an abundance of occult resources easily available to them. Learn how to answer the difficult questions from your children, grandchildren, and concerned friends. Discover firsthand how the desensitization of dangerous occultic and pagan practices continues to grow as a result of the Harry Potter phenomenon. Find out how to effectively deal with your child’s attraction to the Hogwarts School of Witchcraft and Wizardry which Harry attends along with his schoolmates. 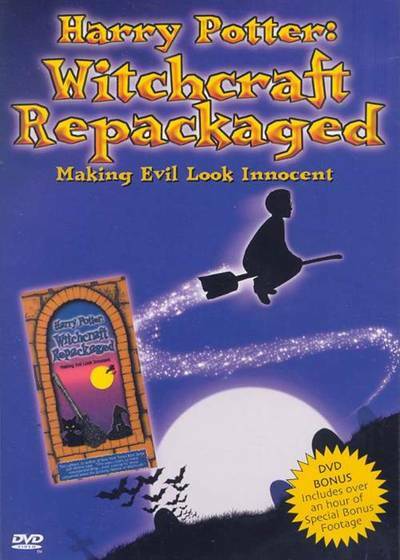 CEANet readers may remember the original VHS version of Harry Potter: Repackaging Witchcraft, as covered in CEANet no. 1244. After having reviewed this informative and well-researched documentary, I give Caryl’s new DVD production my top-notch praise and recommendation. CEANet members are highly encouraged to purchase and share this resource with family, church members, and friends.